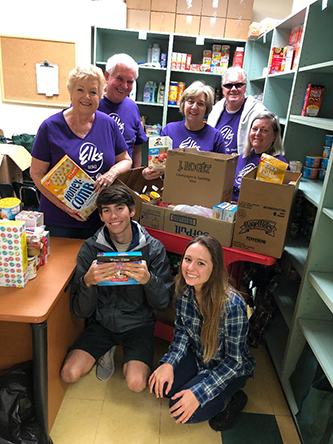 Florida Keys Lodge held a food drive for the students at Coral Shores High School and also provided a check to Voices for Children of the Florida Keys for $1,500. Voices for Children of the Florida Keys is a guardian ad litem program that benefits children in the court system including children who are in foster care, children who have been neglected and children who are in the adoption process. Monroe County has approximately 325 in the program. The donation will help pay for extras that the government does not cover such as school field trips and prom gowns. 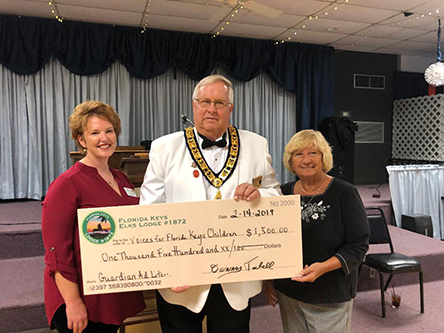 Florida Keys Lodge donated $1,500 to Voices for Florida Keys Children through the Guardian Ad Litem program. It will help provide funds for foster children’s needs that are not provided by state funding. Pictured are Susan Raffanello, president of Voices for Florida Keys Children; Dennis Tarbell, Exalted Ruler; and Sandi Webb, Guardian Ad Litem’s child advocate manager. This donation was made possible through the Elks National Foundation Anniversary Grant. 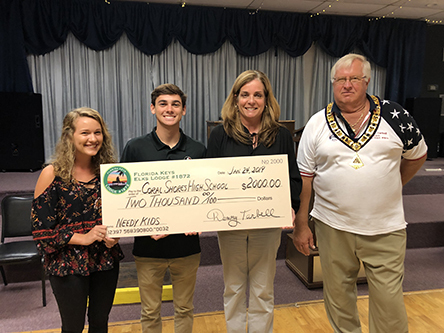 Denny Tarbell, on behalf of Florida Keys Lodge, presented a check for $2,000 to Coral Shores High School vice principal, Anna Alvaro; student government president, Katie Robinson; and vice president, Billy Butler. The donation is for the needy kids fund which helps purchase items such as graduation caps and gowns plus many other essentials needed for students attending high school. The donation was made possible through the Elks National Foundation Gratitude Grant. The lodge also collected donations during January for the Coral Shores food pantry as well. Child Safety Day was held at Florida Keys Elks Lodge #1872 Jan. 12. The Masons prepared child ID kits to take home which included fingerprint, DNA and additional information about each child. Free bicycles were given along with fitted helmets and drug awareness pamphlets. There was an educational display about various drugs for parents. Free hot dogs, chips and cookies were enjoyed by all. 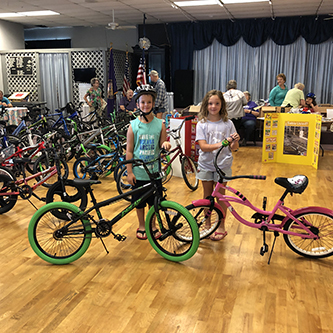 Pictured are Allyson and her brother Matthew with their bikes and helmets. 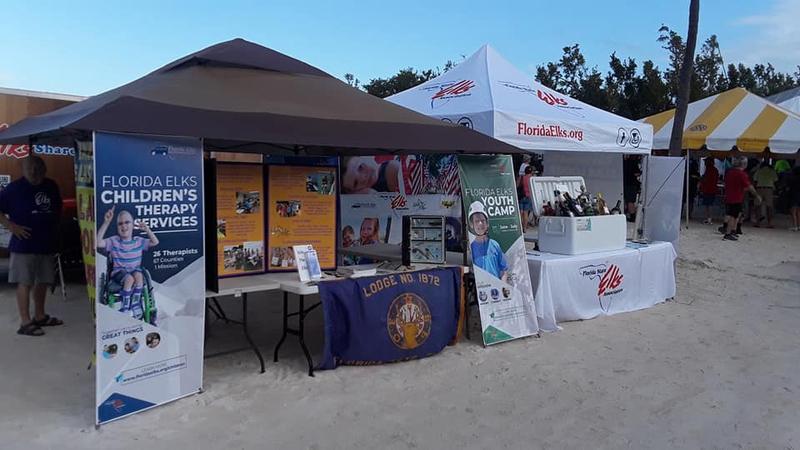 Key West Lodge members promoted the Hoop Shoot and drug awareness programs Oct. 28 at Children's Day held at Key West Park. Filled with bounce houses, rides, snacks and more, The annual event raises money for local children’s organizations and every penny raised goes to the organizations. Florida Keys Lodge held their annual children’s Christmas party Dec. 8 for 92 children. 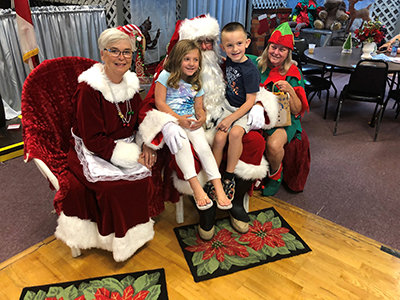 Along with visiting and taking pictures with Santa, Mrs. Claus, and their elf, the kids decorated cookies, saw the fantastic magic of Michael Trixx, enjoyed lunch, made Christmas crafts, and went home with a goodie bag. This annual event is put on using an Elks National Foundation grant. Landon and Coral have their picture taken with Santa and Mrs. Claus (Tim and Patty Hartnett) and Santa’s elf, Hollis Krutulis. 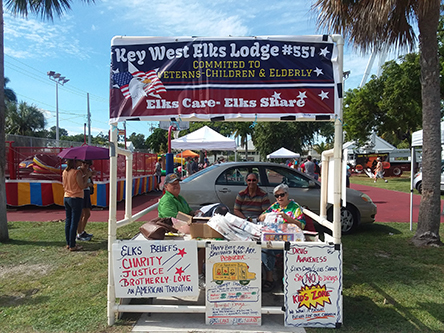 On Oct. 18, Miami Elks Lodge #948 held a presentation for Wheelchairs 4 Kids. Lonnie and Madeline Robinson, the founders of this organization, work in conjunction with Florida Elks Children's Therapy Services therapists who visit children in their homes and administer treatment. They are aware of kids who are in need of wheelchairs and ask for the lodge's help in securing them because their parents cannot afford them. The Elks presented a wheelchair to 15-year-old Julian who has cerebral palsy with spastic diplegia and a gait trainer to 15-year-old Jose who has cerebral palsy and spastic quadriplegia. Their faces and their parents' faces lit up at the presentation. Julian immediately looked comfortable in his up-to-date custom-made wheelchair. Jose, who can only stand with support on both sides, has been wheelchair-bound. The gait trainer enabled him to move his legs and walk with the support of his new apparatus. He smiled and moved around the lodge dining room with ease, and when asked if he was happy, he said "yes, now I can walk with my friends at school." Through members' time and effort volunteering at lodge charity events, members are able to change people's lives for the better. 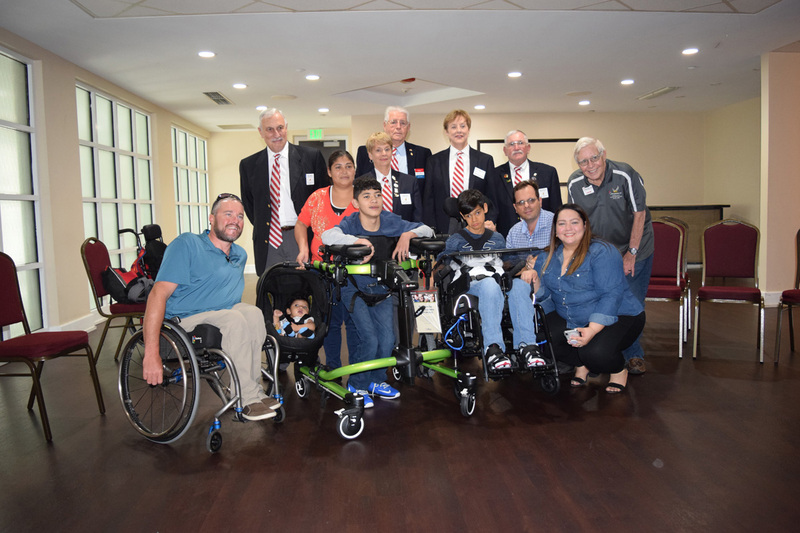 Pictured at Miami Lodge’s Wheelchairs 4 Kids presentation Oct. 18 are Scott McGowan, Custom Mobility rep; Jose Ricardo Sanchez in his new gait trainer; Patricia Avila; Julian Lopez in his new wheelchair; Daniel Heidenreich, Julian's father; Mallerly Romero, Julian's mother; and Lonnie Robinson, Wheelchairs 4 Kids board member. Lodge officers Will Garzitz, Nancy Carr, Al Reker, Kathy Held and Frank Reynolds are pictured in the back row. 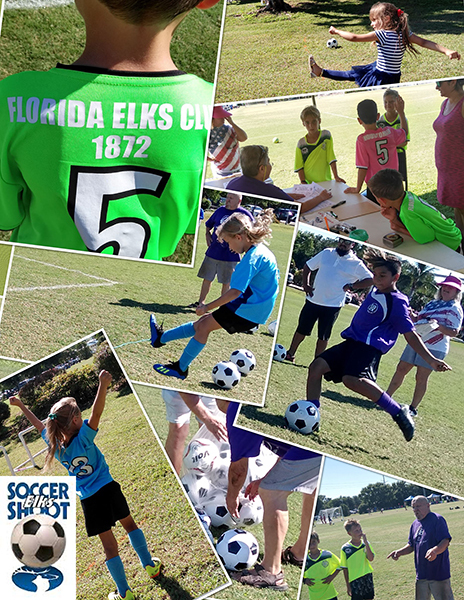 Florida Keys Elks Lodge #1872 held their soccer shoot Nov. 10. First-place winners were Chloe Kessler, U-8 girls; Wyatt Meyers, U-8 boys; Sophia Barry, U-10 girls; Jacob Pickering, U-10 boys; Xol Placencia, U-12 boys; and Jackson Harrington, U-14 boys. These six winners advanced to the regional soccer shoot. 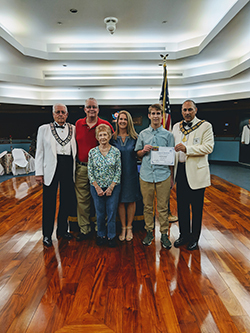 At their general meeting Wednesday, Sept. 5, Miami Elks Lodge #948 honored Hunter Reker as its Student of the Month for September. He is currently a junior at Terra Environmental High School in Miami. TERRA Environmental Research Institute is a secondary public school and is a LEED certified high school. The school has three magnet academies: Biomedical Research, Robotics & Engineering, and Environmental Research. Hunter’s field of study is Engineering. This past summer he worked at the Florida Elks Youth Camp as a counselor-in-training after attending many previous summers as a camper. Hunter’s grandfather is Albert Reker, PDD, Lodge Advisor. Miami Lodge’s Student of the Month, Hunter Reker, is pictured with PDD Al Reker, Tim Reker, Barbara Reker and Kelly Reker.